We received our first fur baby 4.5 years ago when we got Wallace from Puppy Patch Labradoodles! Then 3.5 years ago we became guardians to the ever-loved Sire Tucker, who is the papa to many of the doodle babies loved by the Puppy Patch Families. Two months ago we became fur parents again to Wilson (aka Fir), one of Tucker’s last litters before he was tragically taken from us in a vehicle accident. We are thrilled to be a part of the Puppy Patch family and never hesitate to recommend Annette and Puppy Patch when people tell us they want a puppy/dog like ours! Annette has always been the most amazing, loving breeder. She is extremely knowledgeable about breeding and her company grew out of her love for her fur babies. 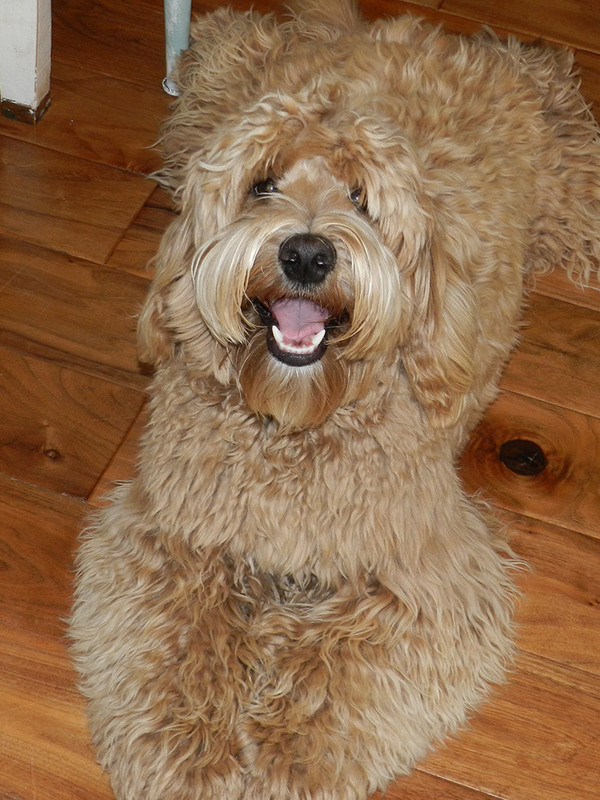 I am so grateful to Annette for giving us the opportunity to love and be loved by our doodles. I would describe Annette as the most passionate animal lover I know! She takes extreme care in placing her puppies, making sure that they are going to the most loving homes! During our time in the guardian program with Tucker, Annette was always accommodating of our crazy schedules… shift work, lots of holidays with our dogs and weekends spent hiking and camping with our dogs. I even gave her a key to my house and she would stop by to pick Tucker up for “work” and even take our other dog Wallace to her house to play if she knew we were away at work and they were home alone! Annette treats all her past puppies and breeding mamas and papas like they’re her own furbabies still! She remembers all their names and who their mamas and papas were! If that isn’t a testament to her love for her furbabies I don’t know what is! One of my favourite memories of Tucker is when Annette would come to pick him up he would literally be doing backflips because he was so excited to see her… he knew exactly what her arrival meant, and he always came home tired and satisfied!! When we lost Tucker, Annette came to our house to say her goodbyes to him and she sat and cried with us. She never blamed us once for the accident that took his life… the loss of Tucker was a big loss to her program but she never once made us feel bad about it… in fact, she knew how devastated we were and she helped us by saving us a spot in one of Tucker’s last litters so we could get Wilson! She went above and beyond for us, taking care of his cremation and getting him back to us in a beautifully ornate wooden box that we keep him in. I could never say enough good things about Annette and Puppy Patch and the love that she has for her animals. I will be forever grateful that we are the recipients of three dogs from her wonderful doodle patch!! Boodles is just over a year old and just taught herself to swim! She’s my toddler’s best friend in the world and does everything with her… Including climbing ladders and going down slides. Thank you Annette Cameron for this amazing member of our family and all you do! We got our Deacon from Puppy Patch through Debi Carlson Martin at Mt. 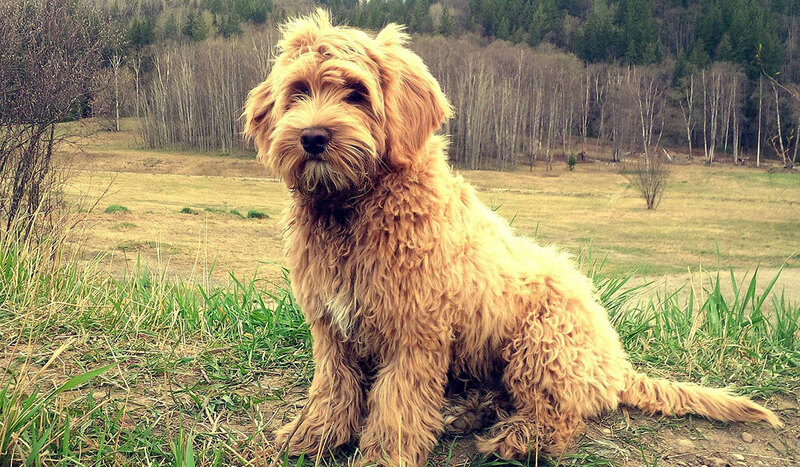 Park Labradoodles. He has been the sweetest and best little guy. Very easy to train and at the age of 2 I got him certified as a Pet Therapy Dog through Pet Partners. He visits Ronald McDonald House several times a month and is much loved by the family and kids there. We thank Puppy Patch so much for our wonderful little guy. This is Murphy (Buttertart). She is the absolutely best puppy ever and I tell her everyday. I can’t imagine how we managed without her and look forward to getting another puppy from Annette Cameron. People can’t believe it when I tell them she was crate trained and potty trained when we got her and adjusted to living with us immediately. This is a very special puppy and I thank Annette for responsibly breeding this totally amazing girl. We are so in love with our Ben. Just looking at him fills our hearts with love. Thank you Annette for raising these wonderful pups. I Love how you love them all so much. This is Ben watching a elk where we are camping..he is like Wow! What is that. No barking. Just amazing to watch. I am so, so grateful to Annette Cameron that we were able to get our beautiful Qiviut from Puppy Patch! People always tell us he is the calmest, most gentle dog they have ever met – a true gentle giant at 69 pounds! He truly seems to understand everything we say, and is perfect in every way! We can’t say enough about our sweet dog, Cedar. She’s almost two years old now, and what fun she has been. She loves to play fetch, hide and go seek, tug of war, as well as her new found thrill of fetch in the lake. She has the cutest, feistiest personality and at the same time is very calm and relaxed in all sorts of situations. She’s a show stopper wherever we go as everyone falls in love with her. The other day I was walking her and gave out Annette’s info to three different people who asked where we got her. Thank you Annette for your care in breeding such exceptional dogs. We couldn’t have asked for a better puppy. Our first guardian girl Molly came into our lives 3 years ago when my oldest son left home to start his own life adventures… knowing that I was going through a very emotional transition, Annette without hesitation and with so much love and support placed this wonderful girl in our home. Molly has brought so much love happiness and comfort to our family. A year later we lost our 12 year old fur baby and again Annette lovingly blessed us with another sweet little guardian Maggie Whether we are laughing and playing or crying and sick these girls are always by our side loving us unconditionally! We continue to feel supported cared for and included in an amazing breeding program and family. Inspired by Annette’s dedication and love for each and every puppy in her program I left a 20 year career path to work with Annette. I am so lucky and honoured to work with Puppy Patch and the most amazing dogs and their families. The puppy patch breeding program produces the most loyal sweet and playful puppies that show so much love and devotion to their people. The generations of puppy patch dogs have been raised this way by Annette and it shows in each and every puppy! Thank you for all that you do Annette! We are forever grateful for our fur babies. Lou and I are overdue to thank you so much for KC. KC’s start in life made a substantial difference in who she is today. KC has been a perfect addition to our family. I had many questions and worries leading up to her adoption 1.5 years ago and you responded to each one and every one then and since. Our pup’s attitude toward life, her family, and people are more than we could have ever dreamed for. Our vet is impressed by her and KC excels in all classes and training she receives. Many good wishes for your next round of pups! We are looking forward to a new addition soon. We love our Scout and puppy patch. Thank You Annette for choosing us to be his family! Our beautiful Caraway enjoying lake life. Thank you Annette! If it wasn’t for you our family would not have all the years of puppy love we have had and continue to enjoy! You are amazing!! Double the doodle fun in our house! We got Max just about 3 years ago and then just under a year later we became a guardian home for Felix. Best decision we made. Here they are loving life! As a guardian home we are extremely happy with these guys and the love, care and genuine concern for their health both Annette Cameron and Jayna share. We are grateful that Annette entrusted us to be responsible for one of her fur babies! Thank you Annette Cameron for such an amazing dog, our friends and family are so in love with Zoey… you gave us an amazing puppy and the whole process was fantastic. You always sent me additional pictures of poppleton (Zoey) when I asked, you always answered all of my questions and you were a pleasure to work with:) here is a picture of Zoey after her first hair cut. Thank you so much Annette for allowing this little beauty to become a part of my life. I receive compliments from so many people about Koda and I’m amazed how many friends and family whose hearts that she has captured. I’m always getting offers from friends that want to babysit her. She is truly an amazing dog and I can’t wait until November when we get her a sibling. I wouldn’t hesitate to get another puppy from you. I think Puppy Patch is a wonderful program. Willow turns two on August 4th – she has brought us tremendous joy and happiness. Thank you Annette Cameron for answering all my questions and providing a great service. Thanks for what you do Annette Cameron.. Cody makes my heart smile every moment of everyday…. you have always shown us love and care for your pups and families. Many of you already know Louise (black) and her mama Rosie. We are guardian family to these two doodle girls. Rosie came to us quite serendipitously when I learned of Puppy Patch and was browsing the webpage. She needed a home and we were aching for a dog that my husband would not be allergic to. I immediately contacted Annette and the rest is history. Our family is grateful for this hypo-allergenic breed of dog and that Annette’s Puppy Patch program was right in our home town where we would see first hand the loving home where she cares for her dogs and pups. Annette welcomed us to her home not only to meet with Rosie, but also later on to visit weekly with our dog as she reared her pups. In fact, we were lucky enough to be present when Rosie first whelped. Having Louise join our family was a no-brainer … they are fabulous companions for us and for each other. Sneeze free and all that.